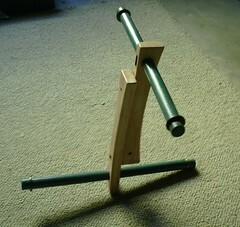 So we started with an idea of getting a home made niddy noddy that did not cost me an arm and a leg, but small change. I went to the thrift store and found what I wanted to turn into a niddy noddy. Better than that no shipping and instant gratification lol! I had to drill two holes, that's about it and screw two new screws in. 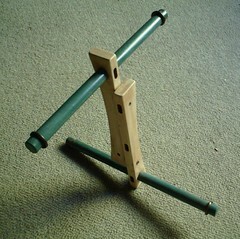 I took it apart and decided how best to assemble this apparatus into a niddy noddy and that is what you see here. There are some metal washers I had laying around and that will make it more techie lol! 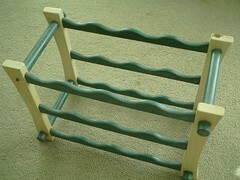 It is now waiting to be sanded again and painted some nice strange colors, have not decided yet.